Offers concise coverage of spices and herbs from basic science to the most recent developments in spice functions and applications. Introduces a new patterning theory of extensive spice use in various types of food preparations. "This fine monograph presents a treasure trove of fascinating information about spice chemistry, use patterns, and the multiple beneficial properties of spices. " 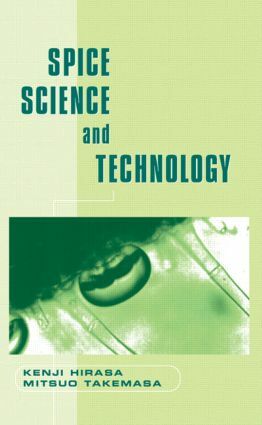 "Spice Science and Technology is chock full of interesting tidbits of information about a heretofore-neglected area of food science. . .. . . .recommended for all libraries that maintain cookery collections. . ..It presents a vivid perspective on the importance of understanding the role spices assume in increasing our overall enjoyment and quality of life. " "The book is interesting and useful to food scientists, microbiologists and biochemists. It should be a useful addition to libraries as a reference material. " ". . .a useful book." ". . .one of the few detailed sources of information on spices. . .. . . .useful as a reference for a broad audience. " Spices and herbs - basic concepts; spice qualities and specifications; cooking with spices; the patterning theory of spice use; physiological effects of spice components; antimicrobial and antioxidant properties of spices; the physiological effects of aroma/flavour.